David Leinail Richmond (April 20, 1941 – December 7, 1990) was a civil rights activist who is best known as a member of the Greensboro Four, a group of African American college students who, on February 1, 1960, sat down at a segregated Woolworth's lunch counter in downtown Greensboro, North Carolina challenging the store's policy of denying service to non-white customers; an event which is credited as gaining national sentiments for the struggle of African-American citizens during the 1960s. Richmond was born on April 20, 1941 in Greensboro, North Carolina. He grew up in the then rural East White Oaks neighborhood, and received his early education at James B. Dudley High School, where he was known as a well-rounded student who belonged to many clubs and participated in many sports. After graduating from High School, Richmond entered North Carolina Agricultural and Technical State University in the fall of 1959, where he majored in Business administration and accounting. 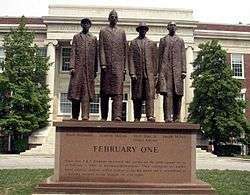 On February 1, 1960; Richmond, along with three other A&T freshmen: Ezell Blair, Jr., Franklin McCain and Joseph McNeil, walked together from the university's library to the downtown Greensboro Woolworth store. Once there, the men purchased items from a desegregated counter, and then sat down at the "whites only" lunch counter where the group was refused service. Richmond and the group stayed until the store closed, and then left to return the next day. As media coverage of the demonstrations grew, more protests were being staged through the state of North Carolina, and other Southern cities. Sales at boycotted stores began to be affected by the protests, which led store owners to offer service to all customers in their establishments. 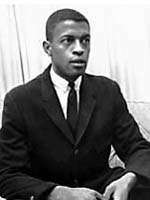 Richmond, who married his first wife while still a student in college, immediately was faced with the demands of his classes and the needs of his family, as well as the new found celebrity due to the sit-ins. As a result, he began to fall behind in his class work, eventually leaving school before receiving his degree. After leaving North Carolina A&T, Richmond became a counselor-coordinator for the CETA program in Greensboro. Due to the events of the Greensboro sit-ins, life for Richmond in Greensboro became increasingly difficult. After receiving a death threat, he was forced to leave Greensboro and relocated to the mountain community of Franklin, North Carolina. Richmond would spend the next nine years of his life in Franklin until his return to Greensboro to care for his ailing parents. Richmond, the only one of the Greensboro Four to return to the city, again found life there difficult. Being labeled as a "troublemaker," he faced difficulties finding employment in the city. Richmond would successfully find work as a housekeeping porter for Greensboro Health Care Center. The Greensboro Four Monument on the campus of North Carolina A&T. (From Left: David Richmond, Franklin McCain, Ezell Blair, and Joseph McNeil. Richmond died of lung cancer on December 7, 1990, at the age of 49. At his memorial service, he was posthumously awarded an honorary doctorate of humanities degree by North Carolina A&T. Other honors awarded to Richmond include the Levi Coffin Award for "leadership in human rights, human relations, and human resources development in Greensboro. "given by the Greensboro Chamber of Commerce in 1980; the James Smithson Bicentennial Medal from the Smithsonian Institution in 2010. In 2002, North Carolina A&T commissioned a statue to be sculpted honoring Richmond, along with the three other members of the A&T four; Franklin McCain, Ezell Blair, Jr. (later known as Jibreel Khazan), and Joseph McNeil. In addition, the four men each have residence halls named for them on the university campus. Richmond, who was married and divorced twice, is the father of three children. With his high school girlfriend Dorothy Harrison (nee Morton), he fathered a daughter, Angela Morton Obi, who was born in 1959. With his first wife, whom he married while in college, he has two children; David "Chip" Richmond Jr. and Hadelyn (Lynn) Richmond Massenburg. Richmond and his second wife, Yvonne Bryson, had no children together. 1 2 "The A&T Four: February 1st, 1960". The F.D. Bluford Library • North Carolina Agricultural and Technical State University. Retrieved 5 July 2014. ↑ "The Greensboro Four", North Carolina Museum of History. Retrieved November 26, 2010. 1 2 "Richmond, David Leinail (1941-1990)". BlackPast.org v2.0. Retrieved 6 July 2014. ↑ "February One Biographies". Video Dialog Inc. Retrieved 5 July 2014. ↑ "David Richmond Biography". Greensboro News & Record. Retrieved 5 July 2014. ↑ Trescott, Jacqueline (5 February 2010). "50 years later, Greensboro Four get Smithsonian award for civil rights actions". The Washington Post. Retrieved 20 June 2014. ↑ "A&T History". The F.D. Bluford Library • North Carolina Agricultural and Technical State University. Retrieved 20 June 2014. 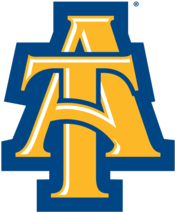 "NC A&T Aggie Fight Song"
This article is issued from Wikipedia - version of the 6/11/2016. The text is available under the Creative Commons Attribution/Share Alike but additional terms may apply for the media files.